September 23, 2018 | Upper Peninsula of Michigan Radio - Yooper News, Interviews, Pictures, and Calendar of Events - Great Lakes Radio, Inc.
Manistique, Mi.– The Manistique Farmers’ Market will be at the Little Bear West Arena this Wednesday, September 26, from 4:00- 6:00 p.m.
Marquette, MI – September 23, 2018 – The Northern Michigan University Board of Trustees today approved a 2018-19 general fund operating budget of nearly $113.8 million. The budget is $3.7 million, or 3.4 percent, higher than last year. The university is advancing its strategic plan with investments in student scholarships, new academic programs, a student success center, and athletics. The increase also covers contractual obligations and inflationary cost increases related to utilities, supplies and other expenses. The board approved the facilities five-year master plan and the 2018-19 capital outlay project request. Public universities are required to submit these annually to the Michigan Department of Technology, Management and Budget. The top two priority projects identified by NMU are: a revitalized Career Tech and Engineering Technology Facility; and an Academic Teaching and Business Innovation Center. If a project is approved as part of a capital outlay bill, the state would pay 70 percent of the cost and Northern would be responsible for 30 percent. The first project would modernize the Jacobetti Complex into a “vibrant, modern, high-tech teaching facility,” according to the project request. The Career Tech and Engineering Technology Facility would put cutting-edge training tools in the hands of Northern students, enhancing their learning experience. It would also support the U.P.’s high-demand CTE workforce of tomorrow, which aligns with the State of Michigan’s goal to increase CTE education to meet the statewide demand for skilled workers. The second priority project would transform the McClintock Building into a state-of the-art teaching and business innovation facility. The NMU College of Business would relocate to the core of campus, enhancing faculty/student interaction and opportunities for interdisciplinary collaboration. The building would also house Invent@NMU, which helps entrepreneurs take ideas for products from concept to market, along with the Innovate Marquette Smartzone. Space would be made available to related entities, including the NMU Center for Rural Community and Economic Development, and Northern Initiatives, a local nonprofit providing financial resources and business services to entrepreneurs. 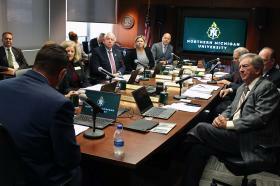 NMU Board invests in strategic plan. -Formally agreed to change the name of the renovated former Marketplace dining facility to The Lights, which opened this semester. -Voted to grant trustee emeritus status to H. Sook Wilkinson, who was appointed to the NMU board in 2009 and served as chair during her final year in 2016. -Authorized a rental agreement between NMU and the State of Michigan, Department of Technology, Management and Budget for two office areas in the University Center for the Department of Attorney General. -Approved the notebook computer program’s annual replacement of 175 additional ThinkPad X1 Carbon Gen 6s, model 20KG (to include warranty, engineering services, software imaging and shipping costs). -Gave the administration authority to negotiate and, if deemed appropriate, purchase 10 acres of property in Marquette Township, which it has been leasing as the tower site for its public radio and TV stations, at a price not to exceed $45,000, including closing costs. -Agreed to set the following meeting schedule for calendar year 2018 (all Thursday-Friday dates): Feb. 14-15 (meeting or retreat); May 2-3; July 18-19 (meeting or retreat); Sept. 19-20; and Dec. 12-13. -Accepted an ad hoc policy review committee’s recommendation regarding revisions to the NMU indemnification policy. -Approved the fiscal year 2019 long-term maintenance project list. 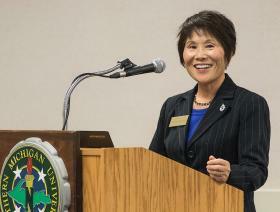 The board’s next regularly scheduled meeting is scheduled Dec. 13-14. Marquette, MI – September 23, 2018 – The Northern Center for Lifelong Learning will present “Green Burial: What is it and why should I be interested?” from 7-9 p.m. Monday, Oct. 8, in room 101B of the Superior Dome. The registration deadline is Monday, Oct. 1. Green burials are becoming widespread across the United States and rapidly gaining acceptance in the western Upper Peninsula. The program will include an overview of the practice and why proponents view it as important. The cost is $3 for NCLL members and $6 for non-members. To register, call 227-2979. For more information, contact event liaison Elizabeth Bates at 345-9295. Marquette, MI – September 23, 2018 – The Northern Center for Lifelong Learning will host a presentation titled “Gerrymandering: What is it and why should you know?” from 7-9 p.m. Wednesday, Oct. 10, at the Superior Dome Room 101B. The deadline for registering is Monday, Oct. 2. The presentation will be about the upcoming ballot initiative on gerrymandering and whether politicians should be allowed to draw their own districts. The cost is $3 for NCLL members and $6 for non-members. To register, call 227-2979. For more information, contact event liaison Sally Olsen at 226-8347. Lansing, MI – September 23, 2018 – Sept. 22 has been proclaimed Falls Prevention Day. Michigan residents are encouraged to use community resources to help prevent falls. To promote awareness about the frequency and health impacts of falling, Sept. 22 has been declared Falls Prevention Awareness Day in Michigan by Gov. Rick Snyder. As part of that declaration, the Michigan Department of Health and Human Services (MDHHS) is encouraging Michigan residents to learn about how to prevent falls, especially during the coming winter months. Fall-related deaths are on the rise in Michigan. Falls are also the leading cause of traumatic brain injuries and injury-related hospitalizations for the senior population. Falls resulted in 804 deaths in 2015 for people aged 65 and older in Michigan, and 15,689 people of this same age group were hospitalized from fall-related injuries. In 2015, medical costs for falls totaled more than $50 billion in the United States. These costs do not account for the long-term effects of injuries sustained by falling, including disability, dependence on others and lost time from work and household duties. To help combat this issue, MDHHS Aging and Adults Services Agency (AASA) is partnering with the Area Agencies on Aging Association of Michigan (4AM) and the Brain Injury Association of Michigan to encourage residents to learn about and use community resources and programs designed to improve activity, energy and independence. A combination of interventions can significantly reduce falls. Experts recommend a physical activity regimen with balance, strength training and flexibility components; consulting with a health professional about getting a fall risk assessment; having medications reviewed periodically; getting eyes and hearing checked annually; and making sure the home environment is safe and supportive. Senior centers across the United States have evidence-based programs like Matter of Balance and Tai Chi which help older adults gain strength, improve balance and increase confidence. In Michigan, Matter of Balance programs are offered at senior centers and many other locations. The eight-session class teaches participants about what can interfere with their balance, and what simple exercises they can do at home to gain strength. More than 6,300 older adults in Michigan have completed this program, and benefit from an increased sense of control and fewer restrictions in their lives. Visit Michigan.gov/aging to find your local Area Agency on Aging. For resources and tips on how to work with your clinician to prevent falls, visit the MDHHS Injury and Violence Prevention Unit webpage at Michigan.gov/injuryprevention. To locate a falls prevention classes through the Great at Any Age program, visit Greatatanyagemi.com. Additional information is available through the National Council on Aging at Ncoa.org and the Centers for Disease Control and Prevention at Cdc.gov/HomeandRecreationalSafety/Falls/adultfalls.html. Negaunee, MI – September 24, 2018 – The City of Negaunee DPW will begin water system flushing on September 24th, 2018. Flushing will generally occur between the hours of 7 am and 3 pm and will take up to four weeks to flush the entire system. Flushing will begin on the West end of town (along US41 to Teal Lake Ave) and progress North of Highway US41. Once flushing is finished North of 41 we will continue on South of 41, some deviations will occur as flushing approaches the water storage tank. When flushing occurs in your neighborhood, the accumulated sediment in the water mains will be stirred up and much of the sediment will be flushed out of the system. However, due to limitations on the system, some sediment will remain, causing discolored water. If your water appears discolored it is recommended that you give it a few hours to clear up then run your cold water faucet for a few minutes to ensure the sediment is cleared. The City recommends water customers avoid washing laundry during the period hydrants are flushed in their neighborhood. Water service should not be interrupted and no boil advisories are required as a result of this process. Please contact the DPW at 475-9991 with any questions or concerns. Marquette, MI – September 23, 2018 – The NMU Best Buddies student organization will host a walk to promote inclusion of and support for individuals with intellectual and developmental disabilities (IDD) on campus. The Best Buddies Friendship walk at NMU will be held from 9 a.m. to noon Saturday, Sept. 29. Participants will meet near the “heart of Northern” on the academic mall outside Jamrich Hall. Best Buddies is an international program dedicated to one-to-one friendships, leadership development and integrated employment opportunities for individuals with IDD. NMU’s satellite walk will coincide with the main event in Ann Arbor, which is designed to raise awareness and funds for the program. For more information, or to donate, visit https://www.bestbuddies.org/2018/05/07/best-buddies-friendship-walk-michigan/ or contact Emma Goebel at egoebel@nmu.edu.